LiveConnections presents classical violinist Luigi Mazzocchi with Brazilian ensemble The Pagode Project in an outdoor lunchtime concert at The Porch at 30th Street Station. This high-energy classical-Latin collaboration showcases Brazilian percussion and works by South American composers. You’ll be singing, dancing and enjoying an eclectic mix of music played by these master musicians. Luigi Mazzocchi, violin, was born in Venezuela, where he studied in the El Sistema Youth Orchestras with José F. del Castillo. He was a member of the Lara Symphony Orchestra, the Chamber Orchestra of Venezuela and the Simón Bolívar Symphony Orchestra. Mazzocchi has performed as soloist with the main Venezuelan orchestras and has attended international music festivals in the Americas, Europe and Australia. He is a prizewinner in solo competitions in Venezuela, Puerto Rico and the United States. He completed a Bachelor of Music degree at Rowan University with Liliana Ciulei and a Master of Music degree at Temple University with Helen Kwalwasser. 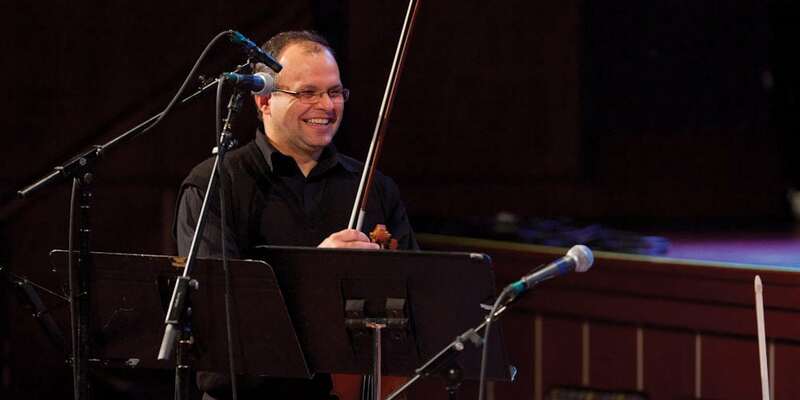 Mazzocchi is the concertmaster of the Pennsylvania Ballet Orchestra, associate concertmaster of the Delaware Symphony and a member of the Opera Company of Philadelphia and the Gaudeamus and Cachasa Ensembles. He has performed with the Philadelphia Orchestra, the Philly Pops and the Serafin String Quartet. The Pagode Project is a Philadelphia-based ensemble fusing the styles and rhythms of samba, jazz, funk and other Afro-Cuban and Afro-Brazilian influences. The word Pagode (pah-GAW-jee) means a “celebration with food, music and dance” and is a subgenre of acoustic samba originally from Rio de Janeiro that uses both melodic and percussion instruments and group singing. Members of The Pagode Project also perform regularly with Alô Brasil, Spoken Hand Percussion Orchestra and various other jazz, rock, Latin and world music projects in the Philadelphia region. The Pagode Project is Patricio Acevedo, guitar & cavaquinho; Jeremy Dyen, keyboards; Dave Palan, bass; Josh Robinson, percussion; Alex Shaw, percussion & lead vocals; and François Zayas, percussion.